I was complaining last winter to my blogging friend The Texan about how the weeding in my garden does me in every summer. She suggested using a hay method like she does. Since we get up our own hay each summer, we usually have a number of old bales around that we need to use up. So I started using them in the garden. It's working really well so far! I need to add more hay to these rows of turnips, kale, carrots and beets. But so much less weeding to do. This may change my gardening life. It works because the hay prevented the weeds from growing? Your garden looks great..
Everything looks so green and healthy! Are you getting a lot of rain in your neck of the woods? It's raining just about every day here. We do have some tomato plants and onions planted. Sounds like a great idea...and as that hay disintegrates, it will add nutrients to your soil! I'm trying something similar this year, but with straw and leaves, etc. I've heard that tilling the garden just turns over new weed seeds, so I'm giving it a try. Here's to a less weedy summer for both of us!! Usually it ain't the weeds that do me in really but the rain that keeps me from doing anything about the weeds until they are over grown. I have tried hay, grass clippings and old roofing metal sheets, they all work well. What a great idea. And it actually looks kind of pretty. That's the way my parents used to do it, only they used grass clippings. Mow the lawn, protect the garden, eh? 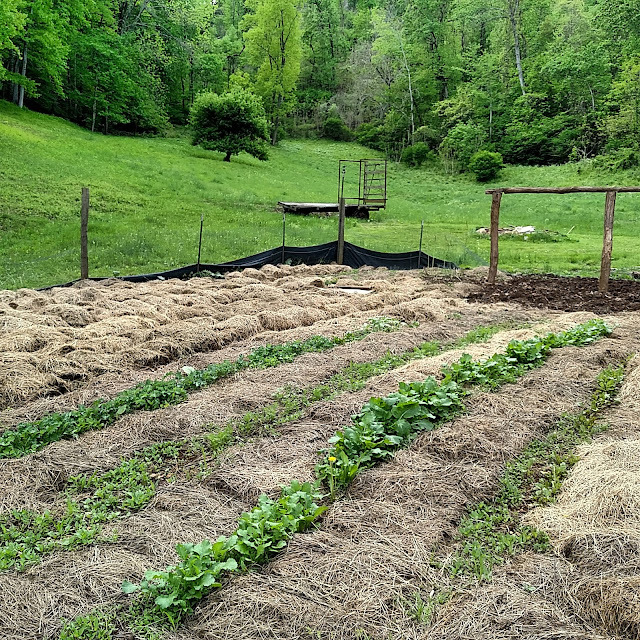 i used oat straw last year and was pleased.Just put in 88 hills of tomato yesterday and 150 peppers today. What an awesome and helpful tip. Trying to catch up after computer problems. I updated my blog if you get a chance to visit. My husband spreads composting and rotting leaves all over our flowers. I'd prefer hay! My husband does this to. He also puts cardboard down before putting the hay, dirt, compost down. It really helps. Hurrah for simple tricks that work great! We do this with leftover straw. We have manure underneath the straw. It does help cut down the weeds! I love gardens but hate weeding! I use grass clippings from my yard because I have one of those old-fashioned reel mowers. Your garden is looking sooo pretty! Good idea! I hate weeding, although it's a bit easier since the ground is wet. Dont the hay seeds make more grass and weesds? Oh, I loathe weeding. I bet the hay will be a lifesaver this year. I'm keeping it in mind if we decide to have a garden this or next year. My late Grandma always kept a compost pile for her amazing garden. This post reminded me of that. When I came home from country school, my mom would tell me to get the hoe and hoe the weeds in our vegetable garden. I can still remember that as not being much fun.